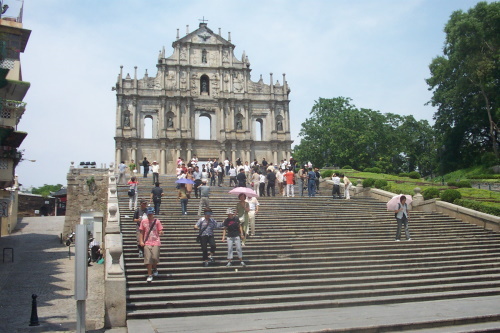 The Historic Monuments of Macao represent its early and long encounter between Chinese and European civilisations. Macao was the first European enclave in Asia. Its colonial history started with the arrival of Portuguese tradesmen in 1557. Over the years they developed Macao into one of the major trade ports in Asia - as a stopover on the route to Japan or as part of the Silk Route by sea. Macao is also the longest lasting and finest example of interchange between Chinese and Western civilizations. The monuments that make up this WHS are divided into two zones. 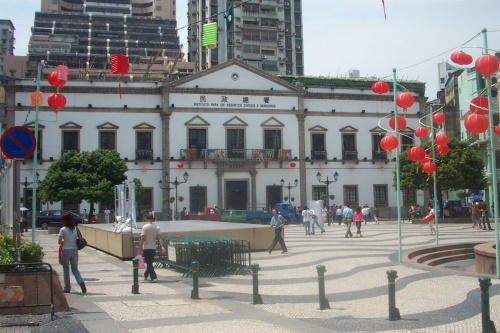 The central area can be found along the Rua Direita, leading from the ancient Chinese harbour in the south to the old Christian city in the north. Major monuments here are the A-Ma temple, the Leal Senado Square and the Ruins of St. Paul's Church. The second zone, a bit more to the northeast, is centered around Guia Hill. Here the Chapel and the Lighthouse are protected. After arriving from Hong Kong by ferry I thought I'd come to construction workers' heaven. Probably there still aren't enough luxury hotels and casinos in Macao. To avoid this overwhelming first impression, I would advise any first time visitor to take a taxi or bus from the ferry to the historical center of town. Macao really is a nice place, if you know where to look. I used the ICOMOS report on the inscription of Macao as a WHS as my guide book. 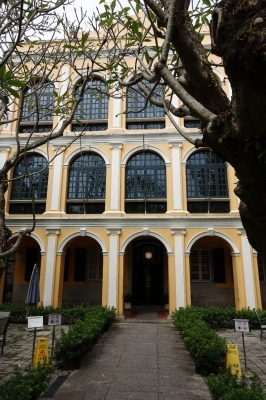 Many historical places, spanning the 16th to 19th century, can be found in Macao's historical center. This area (including a typical market square) is best explored on foot. Guia Hill, the second zone of monuments, is situated in a residential district with some more fabulous colonial houses. A cable car can take you uphill, but I couldn't find it so I dragged myself up via the road. The small tourist information on the hill does a good job in providing an airconditioned room, and has water and tissues for sale. Sure I'm not the only one who walks all the way up. The lighthouse and chapel are in good in repair, and did remind me a bit of Brazil (where the colonial Portuguese heritage is much more extensive). It was already late in the afternoon when I arrived at my final destination: the A-Ma Temple. Or Ma Kok Miu in Cantonese, I discovered together with my taxi-driver - don't expect everybody to speak English here. 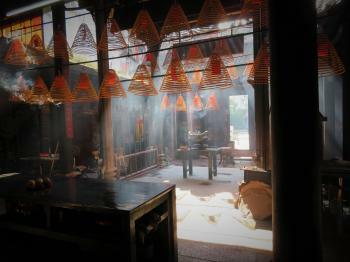 A lovely temple that marks the earliest beginnings of Macao, nowadays a bit off the beaten track. All in all Macao is a great daytrip from Hong Kong. Besides the colonial buildings I also found its atmosphere more authentic Chinese. Allow at least one full day here. As a first stop on my Asia trip I visited Macao. For centuries this was a Portugese colony and it shows in the town center with plenty of colonial houses and churches. 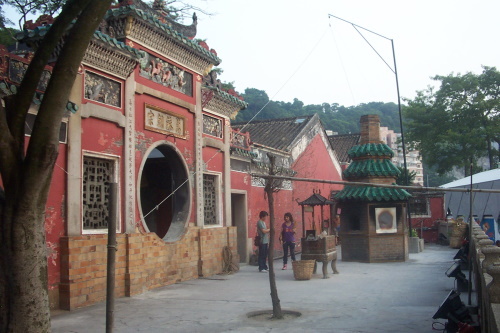 In addition, there are also plenty of unique Chinese buildings and temples that are part of the inner city. This gives the town a unique Asian touch that its Indian counterpart in Goa does not have. And the site is well preserved, also unlike Goa. Personally, I felt more reminded of Panama. But maybe that was due to all the cars, casinos and skyscrapers Goa also prominently features. Places of note for me were the Mandarin's house, the Robert Ho Tung Library and the mint green church. Most visitors will likely arrive from Hong Kong as a day trip by ferry. Tickets can be bought online and have to be exchanged at the ferry terminal. In Hong Kong you have multiple ferry operators offering the trip as well as multiple ferry ports to depart from. If you are staying in Kowloon as I did, departing from the ferry terminal in Kowloon might be the easiest option. Most ferries go to Macao Outer Harbour. From there you can already see the Guia lighthouse and fortress. Most reviewers seem to have taken the cab to the city and if you are short on time that's probably recommended. In my case after a few detours I managed to walk to the lighthouse and from there to the city. Macao has plenty of footbridges and lifts for pedestrians; quite nice when you know where they are, a bit frustrating when you don't. In total I spent a leisurely 4h in the city. Unlike most reviewers I did not return to Hong Kong. Instead I crossed the border at Portas do Cerco into China. It was quite an experience; I have rarely seen a border this busy. To cross into China most will need to get a visa before hand and you need to fill out the arrival card. Directly behind the border is the train station (turn left directly upon exiting the border building). I took the bullet train to Guangzhou from there. Be advised that the train terminal in Guangzhou is located outside of the city center (30min metro ride). You can store your luggage at the ferry terminal. This option is rather pricey (100 HKD for 6h). And nerv wracking, when you try to reobtain your luggage and forgot the color (?) you picked. I would assume most casinos also offer luggage services at cheaper rates, but haven't tested it. In town you can pay with Hong Kong Dollars instead of Macao Pataca using a 1:1 exchange rate. Effectively, you will pay a 3% surcharge, though, as 1 HKD = 1.03 MOP. Surprisingly, most sites seem to be free of charge. Finally, this being a Portugese outpost, you will find plenty of Pastels on offer. I found the quality of varying quality. I visited here on Christmas Day 2007. If you are ever in Hong Kong, take a day to go and visit the Historic Center of Macau. It is to Portugal what Hong Kong was the British. It is less than an hour away by high-speed ferry, and there are boats leaving all the time. Modern Macau is the Asian Las Vegas, with many of the large Vegas hotels also now in Macau: MGM Grand, Sands, Wynn and the Venetian. Historic Center of MacauSaveThe Historic Center of Macau is the old city set up by the Portuguese. 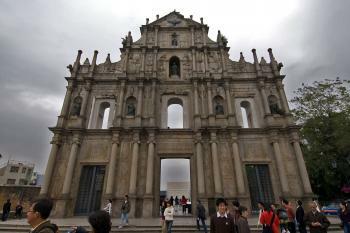 The featured attraction is the facade of St. Paul’s Church which burned down in the 19th Century. There are also other historic buildings in the area, all within walking distance. I visited Macau on Christmas day 2007 and got to taste Chinese treats such as pork floss and Portuguese items like egg custard. 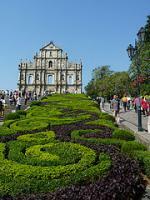 Read more about the Historic Center of Macau on my website. I arrived in Macao at about 1pm and my ferry departure was scheduled for about 7:30pm. So with about 5-6 hours of exploring time, I set out with a very specific purpose to cover all of zone 1 of the Historic Centre of Macao. Always take the taxi to the historic centre first. No need to rehash what's already been covered. I will point out there are additional temples besides A-Ma Temple that are also worthwhile, one example is pictured here. Also the Mooorish Barracks are quite stunning when you turn the corner while walking Macao's small streets. Macao for me was quite fun, and I really enjoyed how walkable the entire zone one route is. I am glad I had the opportunity of 3-4 days in Hong Kong/Macao before making my way to Korea. I was fully satisfied with Macao this second time. I first visited in the late afternoon in 2007, however with poor planning and time restraints I had failed to properly visit any of the Historic Centre. 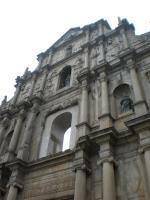 Macao remained as one of most frustrating "close calls" I've encountered on the world heritage list. Luckily, Macao is just a short ferry from Hong Kong, which WHS or not is always worth a visit. I visited this WHS in October/November 2013 and spent 3 days here. There are so many historic places to discover and not rushing to catch the ferry/flight to another place helped a great deal in appreciating the OUV of the series of sites in this inscription with much less crowds (especially in the morning and late afternoon/evening). The highlight of my trip was the A-ma temple apart from the obvious St. Paul Ruins and Guia lighthouse fort. There are Unesco signs everywhere making it very easy to visit on foot. Apart from the historic centre, Macao is a really cool place to visit being aslo a modern city in the making (construction frenzy!) and a gambling mecca! I visited Macao during the cold month of December. Suffice to say that I managed to visit all properties inscribed as its historic monuments. I stayed here for two days without being bored at all. I agree to Ivan's assessment that Macao is largely a misinterpreted site. Beyond the picturesque Ruinas da Sao Paolo, not many tourists get to see the bigger picture that Macao offers (personally, I enjoyed a lot visiting these sites: Largo do Senado, Casa Mandarin, Lilau Square, A Ma Temple, and the Protestant Cemetery compound). Nevertheless, Macao's blend of the East and the West can best be seen through the various religious edifices it has - it is interesting how one Buddhist temple sits side by side a Christian church(in ruins). Though Macao's monuments are at some distance to each other (the Guia Hill being the farthest), I still found going around Macao to be a very refreshing experience. For one, each of the monuments is truly a representative of unique cultural and historical testaments; thus, overlaps of values represented by each are hardly present. Secondly, the government has to be commended for doing an excellent (and colorful) job towards preserving their enduring gems. One can definitely see the tough dedication being forwarded there. However, I also noticed that there seemed to be an imminent problem that the sites will face in the next few years with their seemingly weak buffer zones and lack of proper urban planning and traffic management. Macao, after all, is rapidly growing, and I've yet to see how the government is looking at the preservation of the aesthetic values of the sites amidst modern, high-rise edifices and installations around them. By in large, the monuments of Macao are indeed interesting. There is also another site there that is not inscribed -- though it is deemed to be of high cultural importance for Macanese. This happens to be Rua da Felicidade, a little street that may also be worthy for some attention by tourists visiting the city. I also found my visit to the Santa Casa da Misericordia Museum (its entrance is on the right side of the building) memorable as it is one place where one can see religious artworks as a result to the blending of two cultures and their respective marks of craftsmanship. Offhand comment: the colonial buildings surrounding Largo do Senado reminded me a lot of the buildings within Escolta in Manila - I can just imagine how it would be like if Manila also takes the effort of conserving and reviving its architectural treasures. 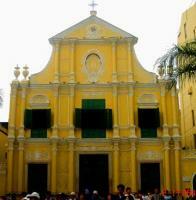 I visited the ancient Portuguese colony of Macau in November 2011. The historic center is really beautiful and presents a great testimony of what was a colonial city. Enjoy the beautiful Portuguese artworks, sometimes mixed with Chinese elements that make Macau unique in the world. The site consists of many buildings and among them; the most beautiful ones are the Senado square, the St Joseph Church, the ruins of Sao Paulo Church and the fortress. The Sao Paulo Church built during the 18th century burnt almost completely in 1835. Only the front façade has survived and is still very impressive. During my short visit to Hong Kong, I went to Macao, the former Portuguese colony in China and the Las Vegas of Asia, and I was really happy to revisit this city again. As I mentioned this trip was not my first time in Macao, in 2002, the first time I saw her, Macao was still a laid back city, but in just eight years, Macao is become the dynamic city with load of fantasy buildings of international casinos! While most of tourists come to Macao for its casinos or its WHS historic centre, the highlight of Macao for me is its food, and its gourmet heritage is the real reason to bring me back here. From the delicious African Chicken, crispy custard tart, unique papaya milk to great noodle and dim sum, make me want to come back again and again. For WHS review, Macao colonial heritages is a nice place to visit, the ruin of St. Paul and Senado Square are the prime attractions, the street is full of many nice colonial buildings together with hundreds of Chinese tourists who will accompany you everywhere you go! While Macao is full of European buildings and feel of Mediterranean, Macao has its own special charm to remind you that this is Macao, not anywhere else, but just Macao and Macao only and that make Macao to be the fascinating place to come and taste! It was quite a journey to walk through each and every building that includes in the Heritage Sites, from A Ma Temple to Guia Fortress. Most are churches with similar size, type and even color (yellow and grey)... yet it could deliver the 'ancient-ness' of the city. I love the atmosphere around The Ruin of St Paul. I believe it is best to be there early in the morning, and on weekdays to avoid over-crowd, as it will give you the sense of solitude when capturing the ruin's detail and taking some pictures..
What a beautiful collection of photos of Macau! As a native of Macau, I am truly impressed by how well the essence of this small but lively city was captured. Growing up in Macau, I had always been proud of the various architectural styles found in this city. If you have a chance to visit Macau, I highly recommend visiting the two outer islands, Taipa & Coloane. These islands are truly heavenly. The locals will definitely agree. Thank you for sharing your traveling experiences with the world! I have finally found an awesome web site to surf when I am missing my hometown. Finally, a long over-due recognition of one of Southern China's most historic yet misinterpreted gems! Little Macao, a stone throw away from one of the world's most modern cities -Hong-Kong- is a city with a lurid reputation. Often branded as an Asian Las Vegas, the historic monuments of the city are ,for most part, simply a quick distraction from the glitzier casinos dotting the landscape. Not that the local tourist body isnt doing much, in fact, they have (IMHO) done a great job promoting and highlighting the city's cultural treasures. Well, maybe the WHS listing can finally balance Macao's image as more than just a casino disneyland. There's a wealth Portuguese architectural treasures in Macao, a city whose charming Iberian facade blends seamlessly with her age-old Chinese roots. For sure, it's a very touristy place especially in the heart of main square (Largo de Senado) but I would to think that thats heritage preservation economics in action. But wander off a little bit and its a world unto its own. Hilly streets open up to intimate pastel colored Iberian plazas, baroque churches, colorful Cantonese temples or busy alley ways that's so evocative of Old China. There's pobablly no other place in the world like it. Lighthouses: Lighthouse dating from 1865. 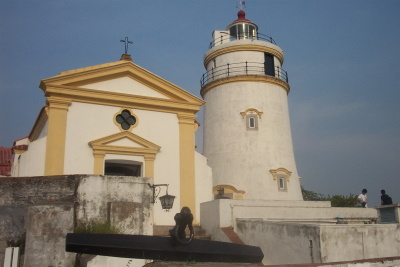 It is the oldest Western-style lighthouse in Asia. Fusion: "unique testimony to the first and longest-lasting encounter between the West and China. ... The impact of this encounter can be traced in the fusion of different cultures that characterise the historic core zone of Macao." Lord George Macartney: Wed 15 Jan. Reaches Macao and stays at the Casa do Camoes "It is most delightfully situated and has a very pleasant romantic gardne adjoining it of considerable extent. The tradition of Macao says it was the habitation of the celebrated Camoes and that he here composed his Luciad"
289 Community Members have visited.